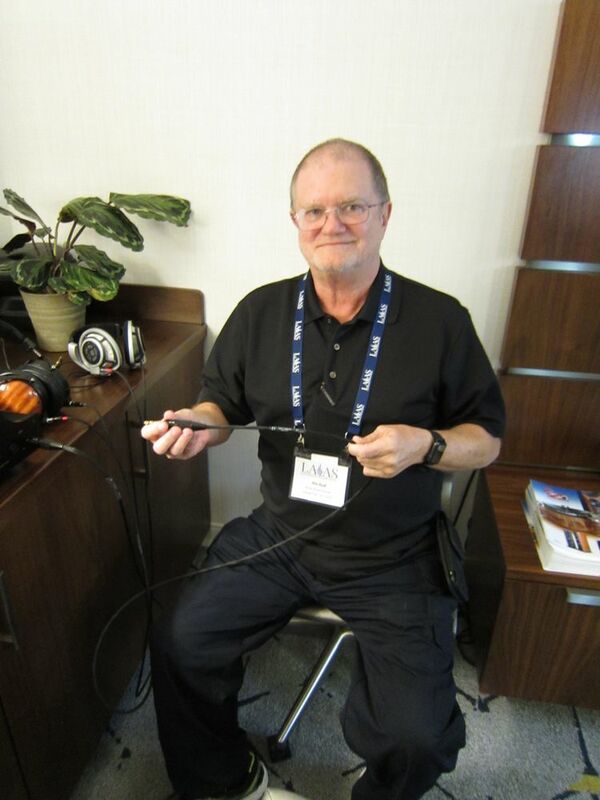 The premier of the LA Audio Show was something of a mixed bag. With veteran show organizer Marine Presson at the helm and Bob Levi and the LA and Orange County Audio Society behind it, I had high hopes the LA Show would be packed. While it seemed to be filled with exhibitors, overall attendance was somewhat lower than I had expected. Perhaps the memory of hallways and rooms full of people was still fresh in my mind from Munich, but there seemed to be plenty of room in the spacious Sheraton Gateway Los Angeles, although some demo rooms managed to fill up regularly. Nevertheless, there were plenty of good sounds to be heard in a comfortable and convenient location. My focus was on headphones and personal audio, a burgeoning segment. Most of these manufacturers were huddled in the “Headphone Planet” area in the Sheraton’s Grand Ballroom. Since this category is not my typical beat, many of the products were new to me, although some had either premiered at CES, in Munich, or at the recent CanJam SoCal Show in April. To get a better feel for the overall show, I also went to several rooms with tasty audio products outside of my category, although I didn’t make it to all of them. No matter what your interest, there were some great-sounding demos for fans of headphones and two-channel audio alike. It’s not surprising that since some of my favorite loudspeakers are electrostats and planars that I was drawn to several headphones using these types of drivers. Unfortunately, some of the best headphone and personal audio gear also sported the highest price tags, due in part to their accompanying electronics. The two best were electrostats from Sennheiser and HiFiMan that were ensconced in the aptly named “Headphone Xtreme” room. Although it premiered last October, this was the first time I heard the flagship Sennheiser HE1 system ($55k with amplification). It’s a honey with lots of fine detail retrieval, bass extension and control, and a rich tonal balance. Both female and male voices were rendered beautifully and seemed to float on a cushion of air. I’ve never heard more detail in Elvis’ “In the Ghetto” track or from Paul Simon’s “Graceland.” The HE1 system’s electronics unit features eight tubes in the preamp stage that sits on a block of Carrera marble, and two Class A amps in each earpiece, approximately 1 centimeter from the electrostatic transducers—about as close as one can get to driving them. Distortion is claimed to be 0.01% at 1kHz (100dB SPL) and helps this headphone achieve a stunning level of purity and naturalness. 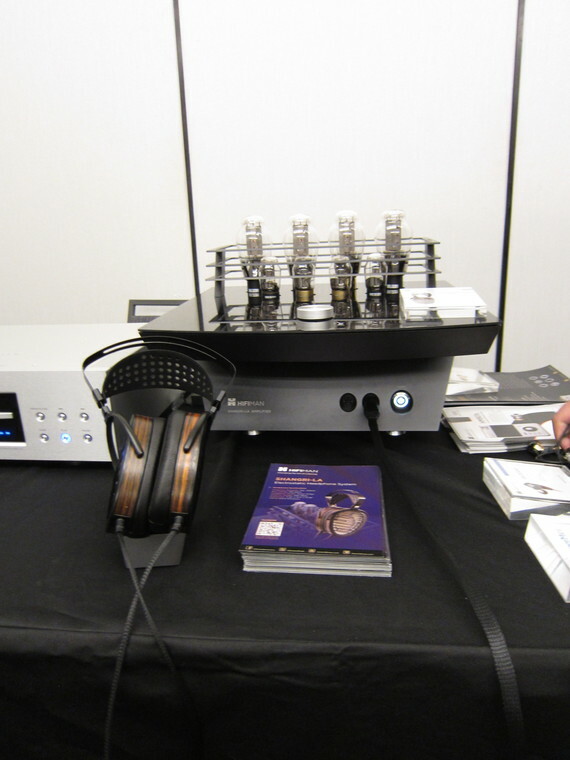 Not to be outdone, HiFiMan showed its formidable Shangri-La ($50k with tube amplifier). It’s the only headphone the company makes with electrostatic transducers, and it gives the Sennheiser HE1 a serious run for its money. I first heard it at CES and was greatly impressed by its openness, clarity, and great bass. It comes with an electronics unit that boasts some of my favorite sounding tubes: 300B and 6SN7. Unlike the electrostatic headphones I owned several years ago, the amazing detail does not come at the expense of added brightness or edge. Both male and female vocals were relaxed and lush, and I found myself enamored by the naturalness of Dean Martin’s voice on the “I Don’t Know Why” track. 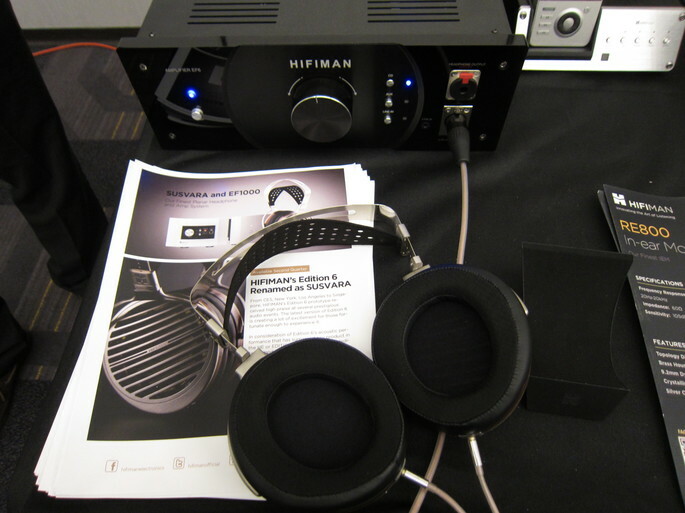 The big news is that HiFiMan’s Susvara ($6k or $18k with EF1000 amplifier) is just starting to ship. While not an electrostatic transducer, its ultra-thin, low-mass planar driver has some of the same appealing characteristics that drew me to HiFiMan’s more costly ’stats. An advanced magnet design reduces “wave diffraction turbulence” to increase purity. The EF1000 Amp System ($15k on its own) is the Susvara’s official amplifier and sports six 6922 tubes, a separate power supply, and six pairs of transistors running in parallel, producing 50 watts of pure Class A power into an 8-ohm load. This combo sounded very clean and quick on cymbals and percussion and had terrific rhythmic drive. The Susvara marks another example of a headphone that’s well balanced, detailed, and has powerful and articulate bass. Perhaps my favorite in this category was Audeze’s new LCD-i4 ($2495), which was introduced at the Munich show. It reminded me of my previous favorite, the discontinued AKG K1000 that also rests off the front of the ear. As one of the Audeze folks said, “They’re in-ears for people who don’t like in-ears. You don’t have to jam ’em down your ear canal.” I really liked the feel of them, but I must admit, you don’t get the isolation that more traditional approaches offer. I’m willing to accept that tradeoff not only because I really liked their open feel and sonics, but also because I found their sound to be smooth, with lots of detail, a wide soundstage, and very good bass—reportedly flat to 10Hz! Their ultra-thin driver technology is derived from Audeze’s LCD-4 headphone, has a magnesium housing, and comes with a silver-plated OCC copper cable with Kevlar threads for additional strength. I wanted to take a pair home with me! 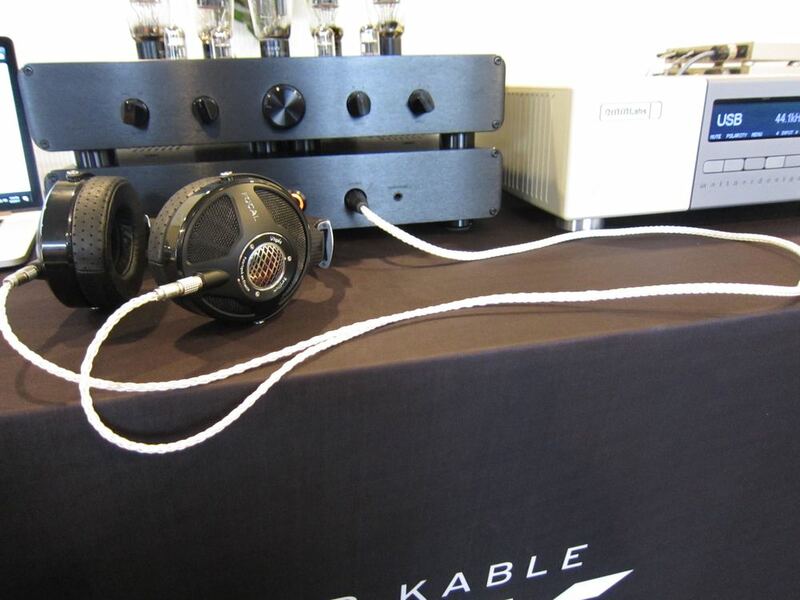 Another of the best headphone sounds at the show came from a system featuring Kimber Kable’s Axios Silver cable (starting at $3k). It is a higher-end version of Kimber’s Axios headphone cable. Like the standard Axios, the Silver has no solder joints except at the connectors, keeping the signal as pure as possible. Teamed with the Focal Beryllium Utopia headphones, Woo Audio WA33 Elite Edition amplifier, and an emmLabs DA2 DAC this headphone system provided great clarity and fine detail retrieval, along with powerful bass. If you want to get the most out of your headphone system, the Kimber Axios Silver wire seems hard to beat. Another really good-sounding can was the Ultrasone Edition 8 EX ($2199) with proprietary S-Logic EX spatial listening and a titanium-coated 40-millimeter Mylar sound transducer. The ear cups are coupled by four strong magnets and can be easily removed with some modest pressure. Not only were they quite comfortable, these were also among the most three-dimensional of the headphones at the show, owing to the S-Logic EX technology. Very impressive! 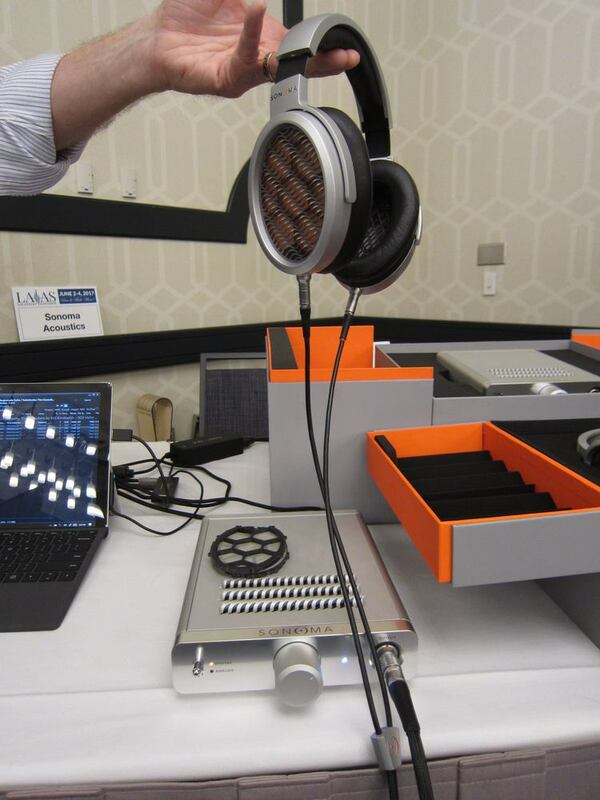 Lastly, the Sonoma Acoustics Model One headphone system ($5000) was another sonic treat. It uses a “high-precision electrostatic laminate transducer” from Warwick Audio that’s reported to be more durable and reliable while still maintaining low moving mass. It includes a custom low-capacitance cable, a Class A amplifier with 32-bit DAC and 64-bit DSP, and injection-molded magnesium earcups. Its USB input accepts all hi-res audio formats. This is a great value in electrostatic headphones with wonderful coherency, transparency, and clarity. Two of the most significant North American debuts came from Astell&Kern with its A&ultima SP1000 ($3499) and KANN ($999) hi-res music players. The SP1000, announced in Munich and available now in stainless steel, features an octa-core CPU and dual DACs (using the latest AK4497DQ chips) allowing playback of native 32-bit/384kHz files. It offers great stereo separation, a high-def, bezel-less HD5 display, and a new multi-function volume wheel. I was very impressed by its new “music-centric” user interface, allowing users to access features and functions very easily. It also has USB 3.0 support to allow faster file transfers and charging. The SP1000’s sound was very clean and powerful on solo piano, and The Beatles’ “Come Together” had terrific punch, great detail, and extended bass. The A&K KANN ($999), which actually debuted at CanJam So. Cal, has a single DAC (a 32-bit AK4490), up to 15 hours of playback on a full charge, a built-in amplifier powerful enough to drive high-impedance headphones, dual memory card slots, and more. The sound of the KANN is similar to the SP1000 but with somewhat less detail and smoothness, but it features full-bodied sound with very good deep bass. The KANN looks like a great value. 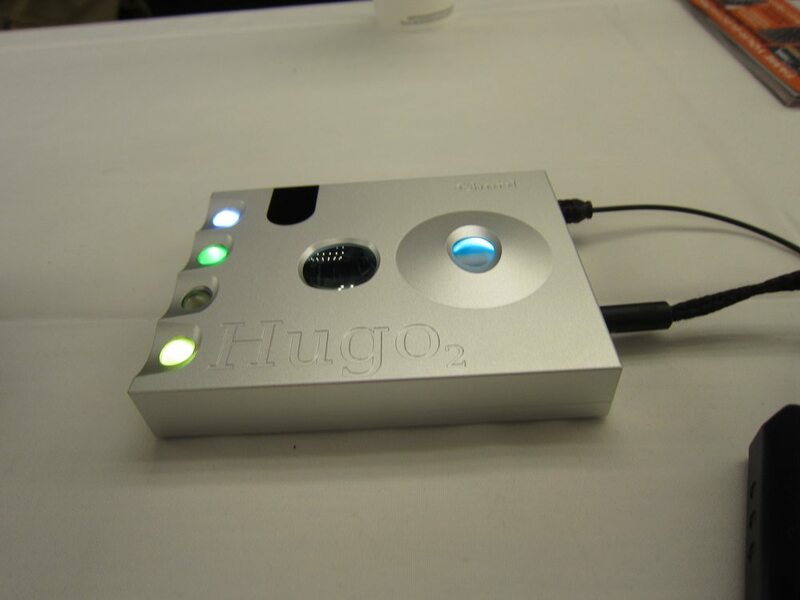 Chord Hugo2 (approximately $2000) will be shipping this month. This DAC-plus-amp combo is designed for both home and mobile use and includes a line-level output and full-function remote for added flexibility. It has four digital inputs, as well as extended-range Bluetooth, plus four analog outputs. Additionally, it supports hi-res playback up to 768kHz and up to DSD512 via its HD USB input. The Hugo2 drove the Audeze LCD-XC headphones effortlessly with lots of dynamic range, as well as great clarity and soundstaging (enhanced by its digital crossfeed function). 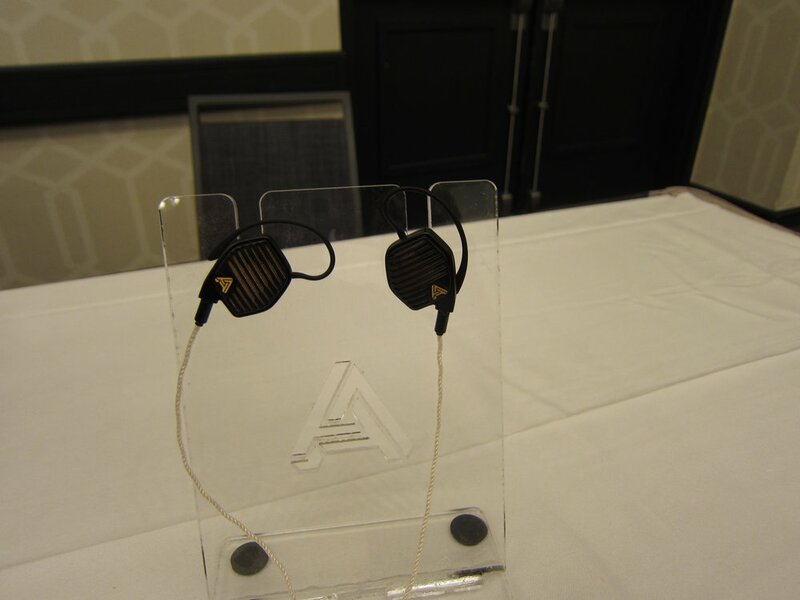 Audio Plus Services premiered a very interesting line of earphones from France, the EarSonics. 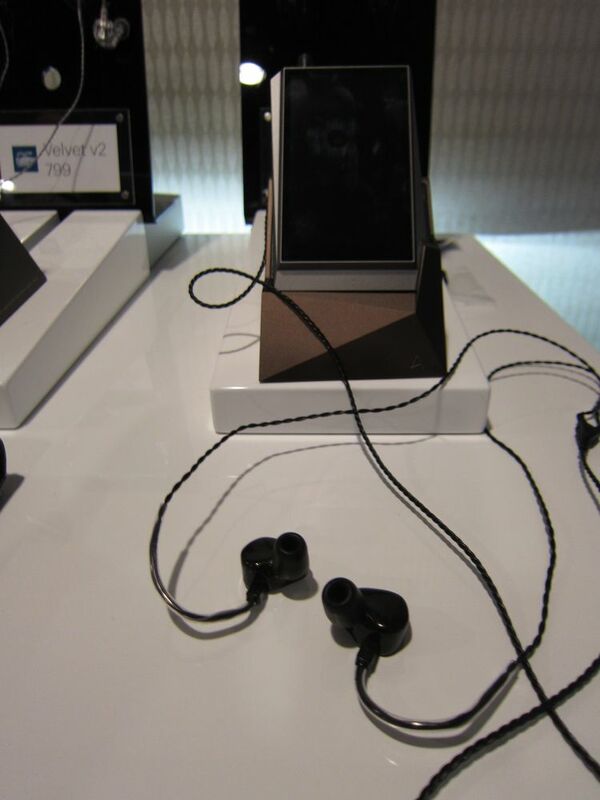 I listened to their S-EM6v2 model, a three-way with six drivers, which was a great match with the Astell&Kern player. It created an easy yet tight seal and featured good detail, natural timbre, and surprising clarity. I was impressed by its ability to replicate solo piano well—always a difficult test. Purist Audio Design was showing its Silver Revision Impresa headphone cables (starting at $685 depending on configuration) with silver wire constructed with Nano technology to improve its conductivity and strength. Listening to a pair of Audeze LCD headphones on the “Dem Bones (Gonna Rise Again)” track, the sound was smooth, extended, detailed, transparent, and clear. 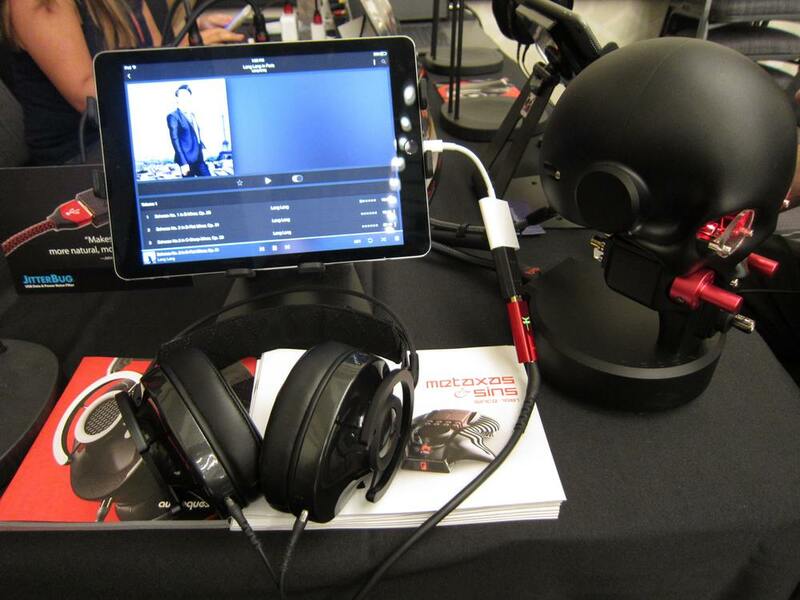 AudioQuest was showing its NightOwl Carbon ($699) closed-back headphone with its versatile and highly effective Dragonfly Red and Jitterbug combo connected to an iPad. This makes for a highly portable and good-sounding package. I listened to a couple of Lang Lang piano tracks and was impressed by the overall sound quality including its tonal balance, extension at the frequency extremes, and clarity through demanding transients and dynamic peaks. They felt comfortable, too! MrSpeakers’ Ether Electrostatic (under $3k) is due to start shipping in September 2017. Like other more expensive ’stats, it was very open-sounding, well-balanced, and detailed. It is a great value! The company’s new Aeon ($800) is a planar-magnetic headphone using an aluminum driver. It offers great isolation, and can be driven by an iPhone. I found it very comfortable and smooth-sounding. WyWire’s Platinum Red headphone cable ($599) uses graphene/carbon to absorb EMI from 5 to 50GHz. When mated with Modwright’s wonderful Tryst electronics and MrSpeakers’ Ethers, the sound was very clear, open, and detailed, vocals were seductive, and bass was extended and controlled. 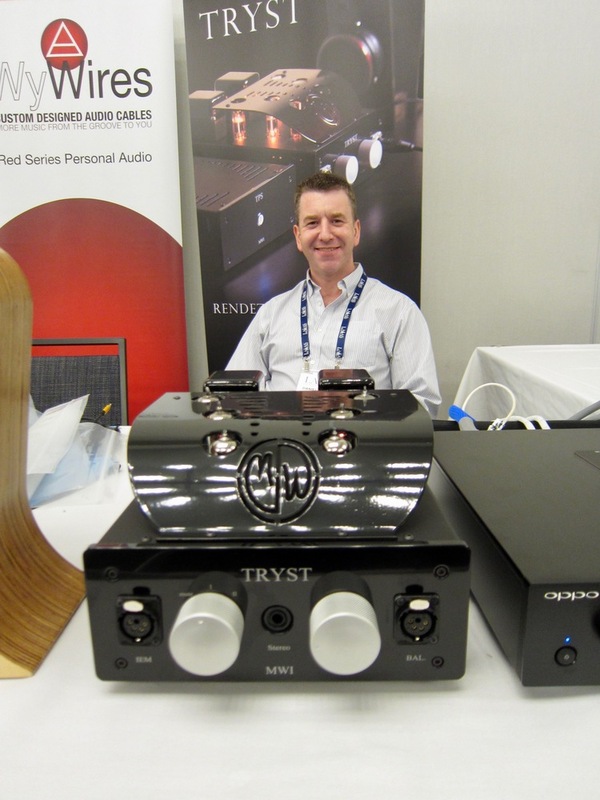 The Tryst ($2995) tube headphone amplifier with 3 watts of Class A power should drive anything and provides a rich, highly musical sonic experience. Questyle introduced a new portable player, the QP2R ($1300), which is positioned above its QP1R. It can be used as a USB DAC and offers a new, more accurate volume control, increased battery life, and additional storage, along with its Class A amplifier with switchable gain and bias. It drove HiFiMan HE1000 headphones, using Kimber Axios cables, very cleanly. 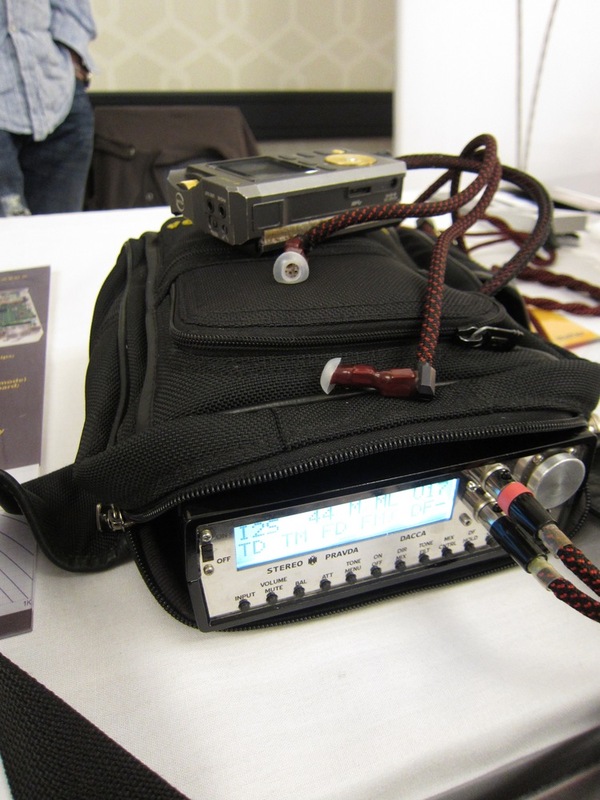 The Stereo Pravda SPearphone SB-7 in-ear monitor ($2500) uses seven drivers per channel, all on the same axis. It impressed me with its open sound, balanced frequency response, and fine detail retrieval when driven by its DACCA portable DAC/amplifier ($6k). I felt like I was listening to my reference system in the near-field. Cardas Audio was showing a 30th Anniversary Edition of its remarkable A8 Ear Speaker ($349). The big difference here is the uninterrupted “internals” in a longer cable using “Ultra Pure Cardas Copper.” With no solder joints, the signal is more direct and pure. Its earpiece is chrome, and the A8 has perhaps the best fit I’ve experienced in a standard IEM. If you have a long ear canal (as I do), these should stay in your ears without popping out, and they are a sonic delight. 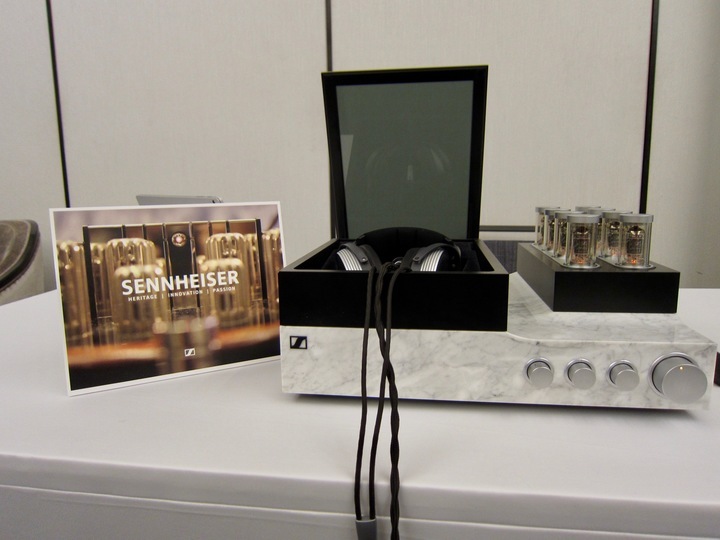 Best Sound (cost no object): Headphones: the Sennheiser HE1 system. Two-channel: the Wilson Audio Alexx (with T+A electronics in LA) and Von Schweikert Ultra 11s (with VAC electronics and Kronos Pro ’table) gave a much better accounting of themselves than in Munich and rose to the top of the stack—among those systems I was able to hear. Best Sound (for the money): In headphones, the MrSpeakers Ether Electrostatic ($3k); and in earphones, the Audeze LCD-i4 ($2495). As in Munich, the Elac Adante with Alchemy Elac electronics was a marvel. 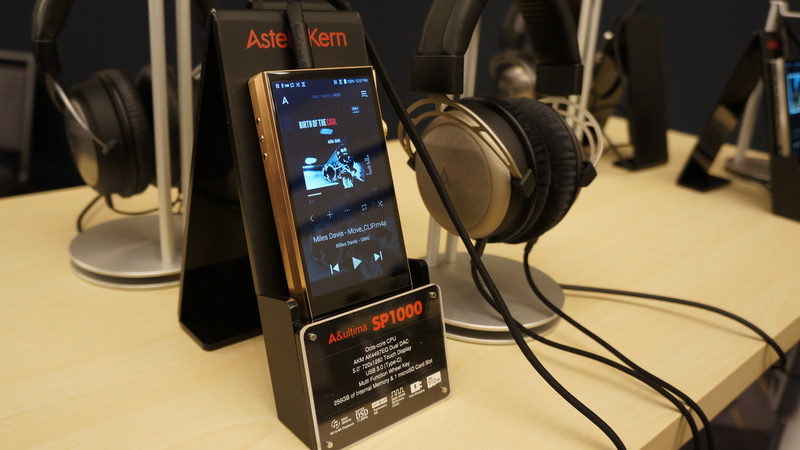 Most Significant Product Introduction: Astell&Kern’s new A&ultima SP1000 ($3499) with its intuitive user interface sets a standard for mobile players. Most Significant Trend: Ultra-(ultra)-thin drivers in headphones and earphones. Most Coveted Products: Audeze LCD-i4 in-ear headphone and MBL 101E MkII speakers with a UHA-Ultimate 2 open-reel tape deck and MBL Noble Line electronics.